Providing reliable real time information has been at the top of the San Diego Metropolitan Transit System’s priority list for many years. MTS launched a very successful texting program with a unique short code 7 years ago. Now, with the full-featured OneBusAway apps, MTS is able to provide far more information and capabilities for its riders on their smartphones. Converting people from texting (540,000 times per month on average) to OneBusAway over the last year has been a challenge. With more than 5,000 bus blades in the system pre-printed with texting info that would require a very labor intensive effort to replace, MTS took a strategic approach to convert texting users to OneBusAway. First, we identified the top 200 stops where texting was prevalent. New decals were made for those bus blades that replaced texting info with OneBusAway info instead. Also, every text sent to riders included a message about OneBusAway. Traditional advertisements and rider information guides were also put on every vehicle in addition to playing messages advertising the apps on our bus stop announcement system. Basically, anywhere we had space, we put an advertisement. The effort was successful, reducing texting usage by about 1 million texts in the first year of OneBusAway activation. MTS also has built its active daily user base to 17,000 users across the iOS and Android apps. 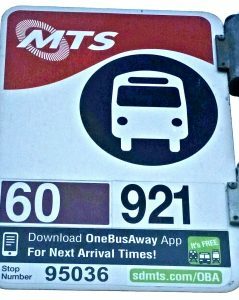 MTS will continue to educate our passengers on the great OneBusAway native apps where riders no longer have to know their bus stop number and text a number to get real time info.